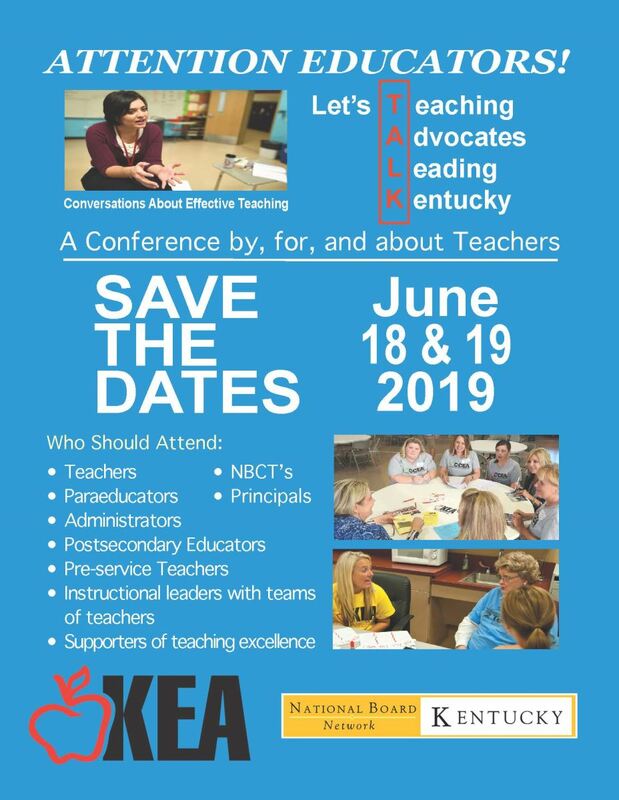 This annual conference is co-hosted by KEA and the Kentucky National Board Network. It is designed to share the great strategies and successes that take place in Kentucky’s classrooms. Don’t miss out on this amazing opportunity. At Let's TALK: Conversations about Effective Teaching and Learning, you will have the opportunity to hear from the Department of Education concerning the new accountability system and connect and learn from colleagues from across the state. This event is by, for and about ALL teachers, especially you! One of your colleagues said of last year's conference: "One of the best things about the conference is I felt like a professional! This is the first PD I've been to in roughly five years where I actually felt INSPIRED and ready to impact my students in a positive way." School/districts registering groups of participants may pay via purchase orders. Include the purchase order number and contact information as you register. KEA will bill the school/district. Register today! We hope to see you there!! To print a conference flyer, click here. 2019 Local Presidents + Next Generation Leaders training event July 14-15-16 at the Four Points Sheraton at 1938 Stanton Way in Lexington for all KEA local/district presidents. On February 1st, California Casualty launched a school Music & Arts Grant program for Kentucky Education Association members. Enter now! Just in time for the 2019-20 school year, 140 grants will be awarded to association members across the country in September 2019. The California Casualty Music and Arts Grant program will consider grant requests for public K-12 schools whose music and arts programs are in jeopardy or in great need of funding. Requests will also be considered for individual classrooms wishing to integrate music and/or arts projects within school curriculum. Click the image below or visit www.CalCasMusicArtsGrant.com.